This was from a random guy we met on a beautiful beach in Tulum (as you do!) Normal people would probably have completely ignored him, but we decided to change our plans completely and instead of visiting Chichen Itza (which is apparently impressive, but you can't touch it), we decided to go exploring into the jungle to find the ruins of Ek' Balam. Yep, we were going road-trippin'. In Mexico. By ourselves. What could possibly go wrong?!? Hiring a car in Mexico- the costs! Watch the video of Ek' Balam and Cenote X'Canthe. Ek' Balam is an ancient Mayan city, which was only discovered in the 1980s! Parts of the site are still being uncovered, which is amazing to see. The jungle is so thick that I don't know how they ever found it in the first place!! Ek' Balam means ‘Black Jaguar' in the Mayan Language and the main attraction is the huge Acropolis in the middle, which you can still climb. This is where the King of Ek' Balam lived, and his people had to climb up the incredibly steep steps to pay their respects. It's an amazing Mayan site- the atmosphere is peaceful and being able to wander around and inside some of the structures is awe-inspiring! There are a couple of options for you to get to Ek' Balam from Cancun or Riviera Maya. One is to take a tour, although one of the beauties of Ek' Balam is that not many tours go there, leaving it as a pretty quiet site to visit. Another option is to take a taxi (or possibly a collectivo- but I know nothing about those!) A taxi would be pretty expensive as it's a 2-hour drive one way!! The final option, and the one we chose, is to rent a car and drive yourself! For some reason, everyone we spoke to went into meltdown when we mentioned we were hiring a car in Mexico, but I promise you- it's no way near as bad as some of the countries in Europe we've driven in. The roads are well-signed, mostly well looked after and the majority of roads are dead straight. As in- there isn't a corner for 20 miles!! Traffic lights are fairly obvious, just be aware the ones on the opposite side of the junction to where you have to stop, not like in the UK where you stop next to the light. Also, Mexicans normally learn to drive with a ‘stick-shift' (gearstick), not automatics, so if you'd like an automatic hire car you need to request it. (We were recommended to get an Auto, as they're often slightly newer- according to the Concierge at our hotel.) We booked the car through the hotel and paid 80 USD for the day. This included all insurance, tax and several other things which we didn't fully understand as it was written in Mexican! We were very impressed with the punctuality in general across Mexico. The hire company said the car would be there at 6pm- and at 6pm it pulled up at the hotel! The guy dropping it off was very friendly (as were most Mexicans we encountered) and was happy to answer our questions. The walk-around was hilarious, as pretty much every panel of the car had some damage on it! Make sure you take note of everything and it gets marked down. Take photos if you need to. Also, make sure you open the boot and know how to open the fuel filler- it took us AGES to find it! FIRST THINGS FIRST- fill your car up with fuel. Seriously. a half-full tank is not going to make this drive. You'll see why in a minute. Also, make sure you have plenty of water and snacks onboard. When you leave Cancun or Riviera Maya, you'll end up on the 180D, which is a dual-carriageway which counts as the main motorway. It's completely straight- just look at a map! Once you get onto this road near the Cancun airport, you won't have another fuel stop for around 140km. I'm not even kidding. We DIDN'T stop at the fuel station on the 180 near the airport (the 180 and the 180D are NOT the same road!) We didn't realise that was the last fuel stop and we had half a tank of fuel, so we figured we'd get the next one. BIG MISTAKE! So we were stuck on this never-ending, straight road, which has no laybys, no emergency phones and no turning places (the other side of the road is hidden behind 30ft of jungle!) There are also armed men guarding compounds (we can only speculate at what might be in there!! )- these guys carry some seriously big guns and are not messing around- we did NOT want to run out of fuel anywhere near them!!! As you can imagine, tensions were…umm… high, inside our little hire car as we watched the fuel gauge get steadily lower and lower without being in sight of any sign of civilisation! Also, watch out for men in hi-vis jackets with important looking arrows who are flagging you down. These are NOT police. They are random people trying to get you to hire them for a tour. You do NOT have to stop for anyone unless it is a police checkpoint, at which point they will be wearing a police uniform. If you do stop, make sure your doors are locked first. We did stop, despite our low fuel levels and mounting tension, and the guy was insistent that we go with him to Chichen Itza. When we explained we weren't going to Chichen Itza, he started listing everywhere else we could go, until in the end we said we were meeting friends are drove off. He wasn't threatening, just a bit pushy. All the Mexicans drove straight past without stopping- it's only the tourists who don't know what's going on. I have NEVER been so relieved to see a fuel station in my entire life!! Also, the toilets were surprisingly clean too but bring your own toilet paper. I'll be honest, Temozón is… not a pretty town. It's full of stray dogs, stray kids and broken everything. We were not sure what the state of the fuel station would be, so we were pleased to eventually find it in good condition! After the fuel stop, Ek' Balam was only a couple of miles down the road. Once you've turned off the main road (it's well signposted) keep going until you get to a crossroads. GO OVER that crossroads… don't go to Ek' Balam Pueblo like us, which ends up in a dodgy little village where there were about 20 women and no men. I think they were as surprised to see us as we were to see them! We turned around and retraced our route to the crossroads. Once on the right road again, we pulled into a car park with the obligatory tourist shop selling everything. A young man approached the car and told us he would watch it for us for a tip (the amount of the tip was up to us.) We gave him 20 pesos (less than £1 ) which he seemed happy with. The car was untouched when we returned to it so that's something! After paying off the guy to keep your car safe, rock up to reception, pay for your entrance tickets and off you go. You DON'T buy Cenote tickets here- we'll get to that later! Tickets were 70pesos each. 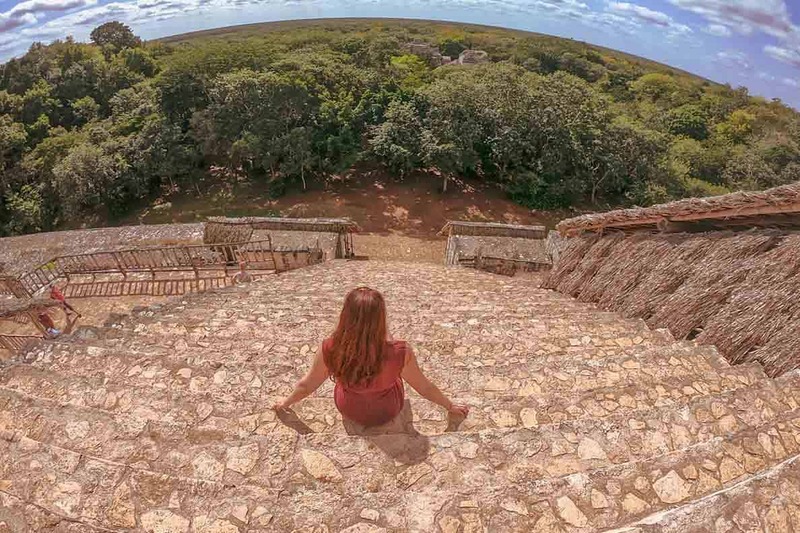 You don't need a guide to explore the ruins of Ek' Balam, although the ruins aren't as well signed as the ones in Tulum. It's up to you if you want someone to explain what you're looking at, or if you just want to go and tour some really awesome old buildings on your own with no-one rushing you. HIDE your Go Pro on the entrance lobby- they charge 45 pesos to film (although once inside we used ours without any issues. Having said that, 45 pesos is less than £2, so you might prefer to just pay it and not worry about it. At Tulum, we bought a guidebook for the ruins which was useful, but we didn't see one at Ek' Balam, which was a shame. As with most ruins around Mexico, there are no toilets inside the site and nowhere to buy water- so make use of the facilities at the reception before you enter and take a bottle in with you. Arriving at Ek' Balam is pretty special. There's a short walk through the jungle, and then you suddenly arrive into a clearing, which is surrounded by the most incredible ruins. This is one of the last Mayan sites which you can interact with. Many of the others, including Chichen Itza, are now roped off, so you can look but not touch. I completely get the reasoning behind this, but it was wonderful to wander around the site and climb the buildings and imagine life there thousands of years ago. We left our swim gear in the car whilst we explored the ruins of Ek' Balam, and then grabbed it after so we could visit the cenote at Ek' Balam, which was AMAZING!! Have you ever visited Ek' Balam or any of the other Mayan sites?? Would you like to? Let me know in the comments below. Enjoyed this post? We'd love it if you took a couple of seconds to share it on social media. Thank you. Yes, we visited Ek’Balam this last February 2019. . It is very non commercial unlike Chicken Itza. And the shape of the main building was linear which is somewhat different than the pyramid shaped Chickem Itza. However, climbing it is for young people. Going up the steps was no problem for us. But at age 70 and 76 coming down was frightful. We were the entertainment for the people that did not climb, as we came down backwards, one step at a time. There were no ropes to hold on to to come down. Also, nearby are the “pink lakes” which was fun to see. Actually they are a commercial salt flat. We also went on an Eco tour of the nearby reserve. We saw pink and white flamingos, crocodiles, and other wildlife up close and personal. It was a long day to and from the Riviera Maya, but worth it to get off the commercial track. Oh, I have driven in Mexico for two years now.